On the same day that Matthew Lehew was made to apologize for his apparent "sin" of daring to analyze via social media Ergun Caner's false statements regarding Brewton Parker's accreditation status, the Brewton Parker Trustee Chairman Bucky Kennedy talked to the WTOC Savannah news station and falsely accused the Southern Accreditation of Colleges and Schools (SACS) of bias against Brewton Parker. So apparently, as Matthew Lehew found out today, telling the truth about Brewton Parker's accreditation is a SIN in the ranks of the Georgia Baptist Convention. But falsely accusing with no basis whatsoever (I'll call that a "lie") that SACS voted to remove Brewton Parker's SACS accreditation because of the school being "...small, rural, and faith-based." well, that is OK. This is the topsy-turvey world of the Southern Baptist Convention and Georgia Baptist Convention. 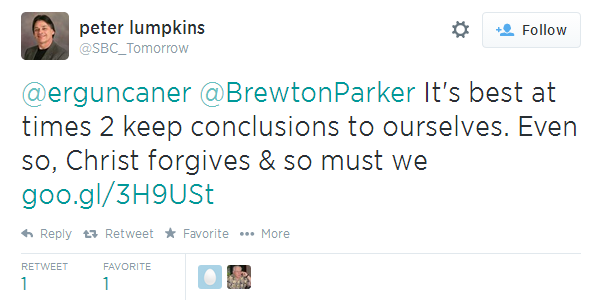 The shortened hyperlink in the Lumpkins' tweet links directly to Lehew's apology post. So according to BP's VP of Communications, the Lord Jesus and Christians everywhere need to forgive Matthew Lehew for his honest and insightful blog post intended to inform Brewton Parker students and parents regarding the accreditation status and the implications to students down the road. And Matthew is not just some recalcitrant blogger with an opinion - he was an accreditation officer at the Baptist College of Florida, which is a SACS-accredited institution. Matthew Lehew's analysis of Brewton Parker's accreditation woes carries great weight. Currently he is an instructor and accreditation officer at Shorter University, a GBC institution as is Brewton Parker. But Lord Jesus is smiling on Bucky Kennedy's lie, broadcast on a local television station institution about SACS and their supposed bias against faith-based, rural, small schools. If there is merit to this claim, let Bucky Kennedy let us know. SACS, I hope you notice that one of your member schools on accreditation probation - who will be before you in a few months asking you to reconsider their removal - is using their local media to lie about you, and accuse you of being biased against faith-based schools. Bucky, you might have just slammed the door shut on Brewton Parker's chances on appeal with your un-founded accusations. Brewton Parker students: after your rally on July 29th fight for your accreditation appeal, you might want to march over to the administration building and demand that serious leadership to be put in place by the GBC to help save your school. Currently it is being run by a bunch of amateurs who are lessening the chances of a successful appeal every day. I know its not good to stereotype a person, or "prejudge" them, but I have to admit that Bucky, not just in name, and not just in the way he looks and talks, but what he says, sure fits the stereotype I have of a Southern Baptist Georgia good old boy. Sheesh. Is this what is left of the SBC? If so, who cares what they say or do? Bucky. Really? 1) Did Kennedy or the reporter use the word "faith-based"? 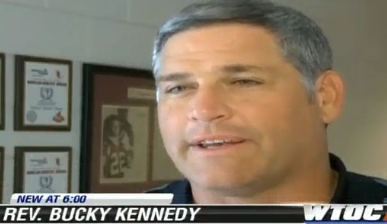 If Kennedy said "Christian" and the reporter changed it, fine, it's a PC kind of thing. If Kennedy didn't say "Christian," he should have to get his meaning across more fully without accommodation. Either way, Dog's critique is still valid. 2) Some think the plan all along has been to turn BPC into a Bible college or an external campus of Truett-McConnell. Notice the words in the article that went with the WTOC video: "Caner feels confident the school will win its appeal. But if it doesn't, there are other accrediting agencies to whom they can submit. Caner said the school would not go without accreditation." 3) Where is brother Emir in all this, president of Truett-McConnell? Silence can sometimes speak volumes. Or will that silence soon be broken? Speak to us, bro! If the BPC and their cronies in the GBC cared anything about the students, they would immediately send Caner and Lumpkins packing adn hire a respectable leader whom SACS can take seriously. The essential umbrella issue facing BPC is forward sustainability, and how sustainable does the school look with "Skipper" Caner and "Gilligan" Lumpkins at the helm. They need to hire a president who DOESN'T dress like a wannabe biker thug, who DIDN'T invent a testimony, and who ISN'T an avid fan of professional wrestling. Look, the leadership of BPC doesn't give a tinker about the students. If they did, they wouldn't have let the college get into this shape. It's a royal mess and the parents who generally foot the bill should pull their kids out of the school. What good is a degree in say biology from an unaccredited college? Nowhere in that report did Kennedy say anything about "faith based bias". It was the reporter that used those words. I don't know Kennedy, and I'm no fan of Caner; but you completely took that interview out of context...and it shows you bias. My thoughts on BPC and the GBC. Please forgive the fact I have to speak in generalities. 1. I wish no hardship to come to BPC itself – the institution, the students, and faculty/staff. I wish success to all. 2. However, for years now, BPC hasn’t had the kind of professional, knowledgeable, and, in some cases, godly leadership/administration it needed. They’ve hurt many good, faithful employees who had no defense at their disposal – and no one in leadership (BPC, Trustees, or the GBC) defended them. 4. I don’t know the facts on all sides, and I know I shouldn’t judge the hearts of others. But it does help “the little person, the underdog” to know that Jesus can discern all things, including the state of my own heart. Thank you for publishing my comments. I will now NOT roll your house with toilet paper. 2:59 good comments. Thank you. May we be more like the Savior, in thoughts, deeds and words. Media campaigns won't change a SACS decision. Schools don't just lose accreditation overnight. They are given many chances to rectify the problems and it is purely the result of inept leadership that they would lose it. When you thumb your nose at the accrediting body and their recommendations, you get what you deserve. Let me also reiterate that any credits earned at the school when it isn't accredited will most likely NOT transfer to an accredited school. Don't be duped by any promises from the administration. That's just not reality. To those who think "the reporter" but words in Bucky's mouth by summarizing his remarks: Baloney! I watched the Bucky-Ergun piece on TV and BUCKY said those words referring the a perceived SACS [sic] bias against faith-based institutions. Now, here's an even better one: over the last few weeks, I have heard people in the community discuss the "futhre of BPC." In EVERY case, the speakers summarized the case this way: "you know, there was a Jew on the Committee and he hates Christian education." NO ONE in the community has a way of knowing anyting about the visiting committee make-up so such information HAD to come from some insider -- Caner, himself??? It gets worse: one speaker actually related that "not only does he (the JEW in question) hate Christian education, we now have a MUSLIM as president and you know what that means." At least three of the speakers in these incidents are employees of the College OR present or past Board of Trustees members. I have worked with SACSCOC processes since the early 1990's -- I have NEVER seen any religious bias and I think that such hate-mongering as not engaged in now by Kennedy-Caner requires that Dr. Robert White step in and clarify the position of the GBC. Does the GBC support such accusations? Does the GBC support the Kennedy-Caner pair slinging mud in any direction in order to divert attention from the biker-thug who likes to pop-off with sexist jokes and references to the "man-gina" in his "speeches" before our troops??? We need to watch to see what Robert White does about this. WHY would any parent think of enrolling their child or continue allowing their child to attend BPC?! I have a son currently in college. I would never support behavior like this with my tuition dollars. When we send our kids to expensive Christian schools it's because integrity and character matter to us. These kid's degrees will be useless. WHY isn't there a mass exodus from this school. Could someone please help me to understand? Brewton-Parker College remains an economic mainstay of the Mount Vernon region. Every business and livelihood in the area would be negatively affected with many failing were Brewton-Parker College to fail. That must be one distressed region, if their economy depends on a tiny college with enrollment hovering around 1,000. Matthew Lehew article is down for good. Shame on Shorter U and GBC. Wow! You talk about censorship. The world is watching as these "leaders" show the world how "their christianity" works--I meant to use a small c in christianity. For any that do not understand how these people operate here is a classic example. The TRUTH is not welcome in their world. I sincerely pray that Mr. Lehew does not get fired. Anonymous: what are the names of the people who made Jew and Muslim comments? Without substatiation, you're not helping. Let's all stand behind our words with our own good names. Having been associated with a school that was Southern Association accredited, you have to foul up badly, really badly to lose you status. Im sure Matt caught so much heat that he had to demand that Dog take it down. The SBC power brokers are ruthless. BTW, have you noticed that no mega pastors have spoken out about this issue? At least the GBC has Bucky running things. Off topic: Rev. Tom Crisp passed July 10th. He was a fine Christian and was an example of a real pastor. He will be missed. You did not post my last comment, probably because I brought in facts and links that you thought did not pertain to the discussion. However, I will say it one more time. To understand what is going on at Brewton-Parker College, you must understand who these people really are. Many of the locals are NOT honest, to include bankers, ministers, businessmen and law enforcement. There is a reason that only the petty drug dealers are caught, and not the cartel leaders. There is a reason that politicians and bankers continue to sit on boards of banking committees even though they went through a bank failure of epic proportions. These are the same people who think Ergun Caner is just fine and dandy. Again, to understand why BPC is spewing insanity all over the cotton fields, you MUST understand this population. BPC cant hire replacements for the lost workers but can hire new vice presidents. If the Board of ed really thinks BPC is god they are crazy.We dont get our reimbursements till the end of the semester, people get workstudy jobs that arent opposed too. No maintenance is being done because there is like three people left in that department. One person in financial aid, no real provost,hardly no coaches. and MOST of the jobs not even posted.Faculty is quitting and it is kept hushed. The bell has tolled here but people are not listening. What kind of Trustees hired Ergun in the first place? It will continue to go down hill and they like Caner will not own up to their responsibility. These guys have double standards as a way of life. One thing I'm fairly sure of is that SACS is not going to be swayed in BPC's favor by accusations of religious bias. If anything it signals how they know they don't have a winnable appeal and are now just slinging mud. And I sure as heck know that they aren't going to be swayed by orange bows and the "Stand with Brewton Parker Day" scheduled for 7/29. Such an absurd idea could only come from the confused mind of Peter Lumpkins. Yeah, Peter, the sophisticated professionals on the appeal committee are going to see how much everyone in the community loves BPC and decide that maybe standards don't really matter that much. Sheesh. Your site has developed the annoying behavior of opening a vide every time I access the site. My first indication is that I hear "voices" from my computer's speakers. Then I have to search down the site until I find the video that is running. If you did this "on purpose," know that it is annoying. If the hosting service has added this, it is still annoying--but you might ask them to stop. There is no way anyone can seriously blame Ergun Caner for Brewton Parker having the issues it has now. Ergun came in the last six months of a four year fight! He is trying everything possible to win this fight for BPC and if goes south it is because of things that were done before he got there that could not be undone. Stop playing the blame game and trying to hunt reasons to persecute EC! I agree that EC is not to blame for the PBC mess, I blame the GBC and prior admins for mismanagement. Having said that, EC is in no way the answer to what ails PBC even if the GBC, and several donors pump a ton of cash into it. BTW, noone is persecuting EC, he is being called out though, and rightfully so. How anyone could trust him with anything is beyond me, but I am def not one of the faire-haired boys. I haven't seen anyone claim that Ergun Caner is responsible for the underlying reasons why BPC's accreditation is all but gone. So it looks to me like you're beating up on a straw man there. What I have seen are people claiming (correctly, in my opinion) that Caner's actions and behavior in the course of the SACS review, as well as simply who he is with the baggage he carries related to his past lies and attempts to cover them up, has done nothing but hurt BPC's chances of retaining accreditation. So, the claim is that someone else started the fire and instead of putting it out Ergun is fanning the flames. While Ergun Caner is not directly germane to whether BPC meets SACS accreditation standards, how can it possibly help BPC's chances when SACS sees his antics: (1) blatantly lied about his past, then blatantly lies by claiming that he didn't lie and that "the consistory" found him innocent, (2) files frivolous lawsuits trying to squelch critics calling attention to his lies, lawsuits which he lost big-time, (3) generally acts in an unprofessional manner not becoming of a college president. Dresses like some wannabe biker thug, makes crude selfie videos deceptively leading interested parties into believing that "everything is fine." The umbrella issue facing BPC as to accreditation is forward sustainability. And I can't imaging that in the eyes of SACS, Ergun Caner instills in them confidence that BPC is sustainable. First of all, theheavy, having the truth emerge about EC is not in any way "persecution." Secondly, BPC sounds like a case of The Emperor's New Clothes, where the truth about the school has been ignored for many years. That they even considered, much less hired, EC solidifies the fact that they are simply a store front for people who want to play big shot and have little concern for actual education. Why would anyone pay to send their kids there? If we are "persecuting" Ergun then Ergun also "persecuted" others. Have you ever asked Ergun to stop persecuting bloggers? It does seem that there are at least three stories being tied together as if they are one. Each of these stories can be debated but it is unfair to Ergun to blame him for SACS putting the school on probation and now dropping them from membership. The only reason I can see that this fits if one can show Ergun as not worked to respond appropriately to SACS (not including his rant after the announcement of losing accreditation). It matters not that you present the errors of others but I do hope you want to make sure you put your information out correctly, if you want this from Ergun. His spin, your spin, all it does is make one dizzy. Another thought about "poor Ergun just started:"
Who have they recently re-hired to help out at BPC? Is it not a recent former president of the school? The one who immediately preceded EC? Why, yes, yes it is. That means Caner must believe Simoneaux handled his 2 years just fine, meaning you have current administrators dating back to March 2011--BEFORE the school goes on probation, I believe. Sorry, Caner owns this. He wanted it, he engaged it as a battle he would win, and now he loses it. And there's no one outside of his own trustee board to blame, either for malfeasance beforehand or negligence in hiring him. SACS may be held in high regard by its constituency, but definitely a paper tiger in the real world of academic results. SACS has its bosses too. Scott, it may be a paper tiger but it is the holder of the standards--and the standards are what SACS says they are. Not maintaining your accreditation is an awful thing to do to your students. It is a two year (and maybe more) effort (every 10 years) at the college where I work. In response to John H, posting on July 15, and regarding Caner's re-hiring of past-president Mike Simoneaux: Simoneaux is a good glad-hander/money-raiser. Based on what I have heard from people who have worked with him, Simoneaux has absolutely NO leadership abilities. BPC "on loan" from Truett-McConnel. That was in Winter 2010/Feb 2011. Now, where was Ergun then. He had just landed at some small school in Texas, after having been let go at Liberty U. Does anybody doubt that Simoneaux was anything but a place-holder for Ergun in the first place?? And Bucky??? What a joke -- or a nightmare! I heard the original WTOC piece where Bucky used the "faith-based" term. Check the channel's website and you will see that the piece has been "edited" to try to make Bucky look a little less stupid. Now put Bucky and Simoneaux together -- and BOTH men seem to prefer NOT to comply with SACS expectations and would be all to happy to get some other "christian" accrediting agency to back the school -- and you have a couple of back-slapping good old boys who may be able to raise some money but neither one is qualified to LEAD an academic institution. Maybe SACS sees that now!!?? Finally, another "anonymous" poster made reference to the "Jew on the committee" and the fact that the college now has a "Muslim" president -- and those references were challenged by yet a second anon poster. I suggest that the doubter visit Mt Vernon, walk into the grocery stores, the Dollar Store, even the PO. Those comments have been passed around town and Vidalia so much that even kids are asking about them. I guess that the Nazis have moved into SE Georgia??? God. It may be, but it may be, and with equal probability, the voice of the Devil." If You Will Write Out Your Story About Bpc And Use Your Own Name, I Will Publish It In My Blog. I'm a graduate of BPC over 40 years ago. I have served on alumni committees including the board of managers, of which I am no longer a member. Caner most likely is the worst decision made by the board of trustees ever! The problem with this is that most the trustees have the same attitude of Caner. The GBC has insured that no one will be approved as a trustee who does not have the same mind-set as these power leaders, many of whom are graduates of BPC. Kennedy who is trustee chairman is a past president of the GBC and BPC alumni, Waters is a past GBC president and BPC alumni, the current president of the GBC is an alumni of BPC and all are as quiet as a mouse on this matter. Why? They are the same type leader as Caner. BPC, GBC and SBC are on the road to failure but these "power brokers" seem to think that their will and their way if more important than the saving of our institutions. I hear that Caner has been invited to speak at the Laurens Baptist Association in Dublin, Georgia and for the Consolation Association in Baxley, Georgia. It seems that so many approve of Pharaoh that they have joined his army. Always remember what God did to Pharaoh's army! Aside from Caner, I've heard all the guys Blue Blood Baron mentions preach, and many others from the area. No one exposits Scripture as God intended, with a handful of exceptions. Most don't know how. Others could but won't. (Might lose their cushy jobs if they seriously opened up Scripture and rocked the culture-boat.) Some aren't even truly called. Messages are full of what I call "cutesy crap." All this ties in to BPC because the entire culture itself -- school, churches and community -- is sub-par in so many ways. The quality of preaching only contributes to keeping levels low. In some sense it's not the fault of the people. Preachers, leaders and educators will be held accountable. If not in this life, certainly the next. Yet so many think they're oh so blessed. They are mistaken. I'm posting a link to a thread that I started on City Data.com entitled, "South Georgia is Breaking Bad". Watchdog, this keeps the links off of your site. This area has always had a "Dixie Mafia" reputation. As a matter of fact, Toombs County used to be known as Bloody Toombs (some history from the locals). For those who are not familiar with this area, Toombs County is next door to Montgomery County (home of BPC). Again, this area does not have a good reputation and is known for its "lawlessness". These are the classic Southern good 'ole boys. Outspoken, honest people are avoided like the plague. Why? Because you're probably talking about someone's cousin (cue the banjo). We have currently seen the BPC orange bows on or at the following places: Montgomery County Sheriff's sign, local restaurants, Fred's Super Dollar, Friendly Gus across from the school, on residents' mailboxes, etc. They're all over Mount Vernon. This act of "Stand with BPC" is total ignorance. They're trying to convince the community that this is some type of religious persecution. The ignorance is astounding. The corruption is even worse. People don't understand the SACS process. We recently rode through the BPC campus and it looks terrible. Trash outside of buildings that just stays there. A condemned building on property. Saliba Chapel needs a good pressure washing. The shrubbery is never trimmed properly. It almost looks abandoned. The walking track and soccer field looks better than any building on campus. The dog has been real quiet here lately. Hmmm. Hey, don't you know to let "sleeping dogs lie"? Not sleeping though, just taking a rest during these summer months. My followers have given me a "sabbatical". Hope you all are having a great summer. There are those of us who make this blog a daily stop and were beginning to worry about you. Post your last comment on your main page, k? So how do Ergun Caner and Mike Simoneaux intend to keep Brewton-Parker accredited? Remember Caner's video promising continued accreditation?? Just this evening word leaked out that BPC is applying for accreditation with TRACS. That stands for the Transnational Assoc of Christian Schools. TRACS was founded in the 1970s by the Institute for Creation Science. Wikipedia says that there are about 4600 Title IV colleges and universities in the US. Title IV means that students there have access to federal funds for their education. TRACS now accrredits ab out 56 schools and has 8 schools in the process of applying for accreditaion with TRACS. TRACS accredits what are typically referred to as Bible colleges. Liberty University (remember that Caner had a position there) cancelled its TRACS accreditation several years back. If Creation Science rings a bell, check out Truett-McConnel (Ergun's brother is president there). Truett recently built a Center for Research in Creation Science. So much for Mike Simoneaux's promise to faculty a few years back that he did not intend to turn BPC into a Bible college, or in to Truett South. Looks like the Caner-Simoneaux-Caner trio is well on its way to bringing a Bible College to SE Georgia!!! And since TRACS accreditation will allow BPC students access to federal financial aid (if we assume that BPC is accepted by TRACS), then the school will have themoney to hire more Caner associates.